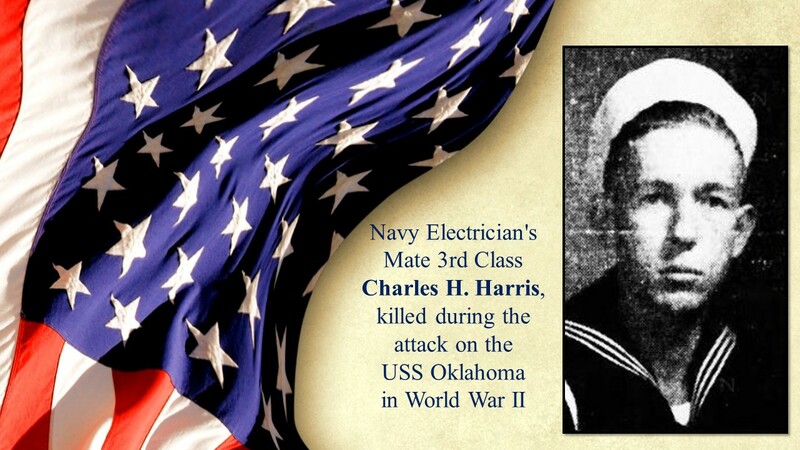 The memory and sacrifice of Navy Electrician’s Mate 3rd Class Charles H. Harris, killed during the attack on the USS Oklahoma in World War II was honored on Monday February 4, 2019 at the National Memorial Cemetery of the Pacific. Harris, whose name is recorded as one of the missing from World War II, was accounted for on April 26, 2018. For 69 years, according to a November 20, 2018 article by David J. Mitchel of The Advocate, Harris’ remains had been among several hundred crewmen whose remains had been declared as “non-recoverable” by the Defense Department. Only 35 of the dead Oklahoma crewmen were able to be identified immediately after the attack, which killed 2,402 in all and debilitated the U.S. Pacific Fleet for a time. In 1947, after the Navy had spent nearly three years salvaging the Oklahoma, including pulling human remains from it and burying them, the American Graves Registration Service disinterred those remains but was unable to identify any new crewmen. Harris’ name is recorded on the Courts of the Missing at the Punchbowl, along with the others who are missing from World War II. A rosette will be placed next to his name to indicate he has been accounted for. The 388 sailors and Marines with the Oklahoma who were listed as unknown at the National Memorial Cemetery of the Pacific are are amongh thousands of unknowns buried there, including some who also perished during the attack on Pearl Harbor, but since 2015, officials with the the Pentagon’s Defense POW/MIA Accounting Agency have been working on a new policy to recover and identify remains of the unknown, relying on extensive research on family history, along with obtaining medical and dental records, and DNA technology, according to KHON2. “We’re going to start with the USS Oklahoma, but we will also be looking at other unknown graves to determine if they are eligible for disinterment in the future,” Lt. Col. Melinda Morgan told KHON2. This entry was posted in Honor Wall, Veterans.